Obama is Trump’s more sophisticated, articulate liberal antecedent. 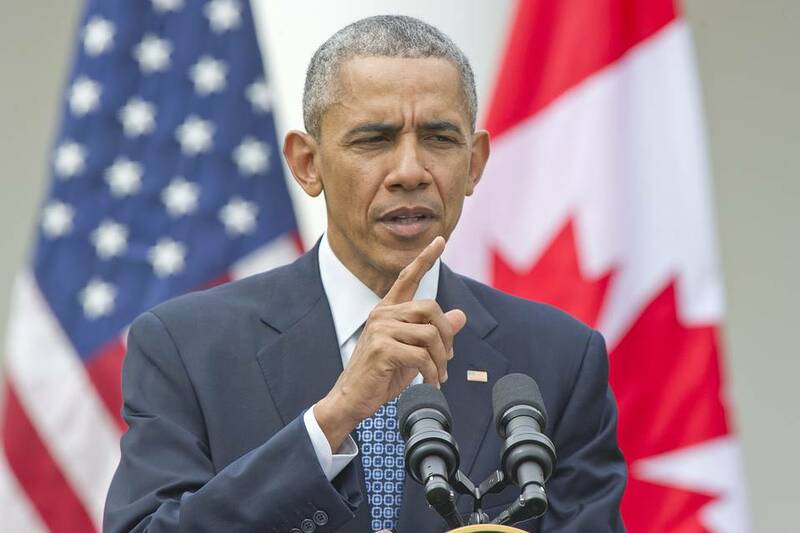 President Obama is said to be a reflective man, and often he is the one saying so, but you wouldn’t know it from his Thursday press conference with Canadian Prime Minister Justin Trudeau. Asked about political polarization and the Donald Trump phenomenon, Mr. Obama denied all responsibility. He doesn’t seem to appreciate the kind of country he will leave behind. “What I’m not going to do is to validate some notion that the Republican crack-up that’s been taking place is a consequence of actions that I’ve taken,” Mr. Obama said. He explained Mr. Trump’s ascent as the result of “the nasty tone of our politics, which I certainly have not contributed to.” He blamed Republicans for this tone, as ever. As Mr. Obama tells it, all of this reflexive Obama bashing created “an environment where somebody like a Donald Trump can thrive. He’s just doing more of what has been done for the last seven and a half years.” In other words, Republicans didn’t clean up the standing water in their own backyard and now they’re complaining about mosquitoes. One irony is that even as Mr. Obama denied any liability for Mr. Trump, he lapsed into the same rhetorical habit that helped fuel the businessman’s ascent. For Mr. Obama, principled opposition to his policies is always illegitimate or motivated by bad faith. Like the President’s nonstop moral lectures about “our values” and “who we are as Americans,” by which he means liberal values and who we are as Democrats, he reads his critics out of politics. No wonder so many Americans feel disenfranchised and powerless. And if we’re being objective, maybe Mr. Obama could account for the populist uprising among disaffected Democratic primary voters for a 74-year-old Vermont socialist vowing an economic revolution. Bernie Sanders is Mr. Trump’s leftward duplicate. The difference is that the Democratic establishment is doing a better job keeping their outsider away from a delegate majority. The source of this public frustration is no great mystery. For the 10th straight year, the U.S. economy is growing by less than 3%. Such a long stretch of underperformance hasn’t happened since the 1930s. Slow growth for a decade means middle-class incomes are stagnant, which in turn increases economic anxiety, which in turn creates political unrest. As for tone, the 1980s and 1990s featured bitter partisan conflicts—and for that matter so did the 1880s and 1790s. But the late 20th century had popular two-term Presidencies almost back to back, and the era didn’t produce backlash candidates promising to burn Washington to the ground and salt the earth. The reason is that the economy was booming. Mr. Obama’s apologists claim 2%-2.5% growth is the best we can do, but the truth is that the natural dynamism of the U.S. economy has been swamped by waves of Mr. Obama’s bad policy. Instead of a second term that is bereft of domestic achievements, in an alternate universe he might have worked with the duly elected Republican majority and started to repair the economy from the center out. Instead, Mr. Obama has shown contempt for institutions that he doesn’t run, and, notably, most of his growth-subtracting policies have been imposed through unilateral executive action. He doesn’t do persuasion and compromise. Some policies were intended to sow division, like his lawless immigration order that inflamed the restrictionist right, divided Republican elites and was only stopped by the courts. The nature of Mr. Trump’s appeal can be explained by Mr. Obama’s own rule-by-regulation governing methods and polarizing political style. You might even call him The Barack, the more articulate and sophisticated liberal antecedent to The Donald. The stability of the American political system depends on deeply rooted norms. What this primary season has revealed is that when a President violates these unwritten rules, the damage to self-government leads into uncharted territory.